Whether you are renting a spare room, your entire home or looking for the right guest to stay while you're away - FlatClub is here to help you get it done. Check out our new compilation guide with all the tips, tricks and basics of hosting to get you started on the right foot, primed for success. A great profile does wonders to the right attention from the right guests. Think of it as your shop window. We highly recommend adding a photo of yourself & a short personal intro. When booking online, guests want to know who you are and be reassured that it's the right fit for both of you. When you opt-in for Best Price Guarantee, you’re reassuring potential guests that they will not find your room or flat at a better price anywhere else. Best Price Guarantee just makes it that much easier for a guest to go ahead to send you a request. For more information, read our blog and sign up. We offer 2 free services at FlatClub: copywriting & photography. Our free photography service is available in many cities and will help your flat present at its best. These services are available to anyone who’s posted a flat. Request photography here, and copywriting here. Your title should quickly inform guests of the most important pieces of info - location, room vs an entire flat, number of bedrooms, and anything else notable. If your flat is near a campus, workplace or a city landmark, it’s a good idea to mention that as well. It’s best if new hosts price their flat a bit lower than more established hosts, as it is a way to get interest & reviews in your flat early on. Find flats in the same area as yours & around the same size, then price it just a bit lower than the comparable flats. We coordinate support services to make your booking process even easier. We offer guest key exchange, cleaning and valuable storage. Purchase these services as a package, or ad hoc as needed. When you’re writing the description of your flat, there is an option to explain how your keys will be delivered to your guest. These instructions are automatically sent to the guest when a booking is confirmed. Our suggestion is that if you’re unable to hand over the keys in person, you leave them with a trusted person or use our key delivery service. Our algorithm informs where and how your flat appears in the results presented to guests. There are a number of actions you can take to improve your ranking. Check them out here and do all that you can! Joining a club verifies your membership to a university or workplace network. FlatClub has partnerships with numerous universities, companies and organizations and verified club membership provides a unique layer of trust in the FlatClub host & guest community. Search for your club, and if you don't find it request one to add to the platform! One of the easiest ways to boost your search ranking and be a better host is to routinely update your availability. If you are already listing elsewhere on the web, the easiest way is to sync another calendar that you use with your calendar on FlatClub. When a guest is interested in your flat they will do one of two things: send you a message, or just send a booking request straight away. A message means they are interested. A booking request means they are ready to pay. Responding promptly to both messages and requests are crucial to booking. Answering questions promptly and thoroughly is the most powerful way to increase the likelihood of booking your place. It reassures guests that you are reliable and responsive and gives you the opportunity to explain why your place is a perfect fit for them. When you accept a booking request, you will receive an email containing your guest’s phone number & email address. We recommend keeping communication within the FlatClub platform for easy organisation. It also makes it easier for our team to assist if need be. 14. Getting Paid - The Best Part! FlatClub takes payment upfront from the guest and pays you 72 hours after your guest has checked-in. This policy is designed to ensure everything goes smoothly at check-in. You are always protected by the terms of your selected cancellation policy. Make sure that you’ve entered your preferred payment details. (‘settings’ and ‘payment info’). 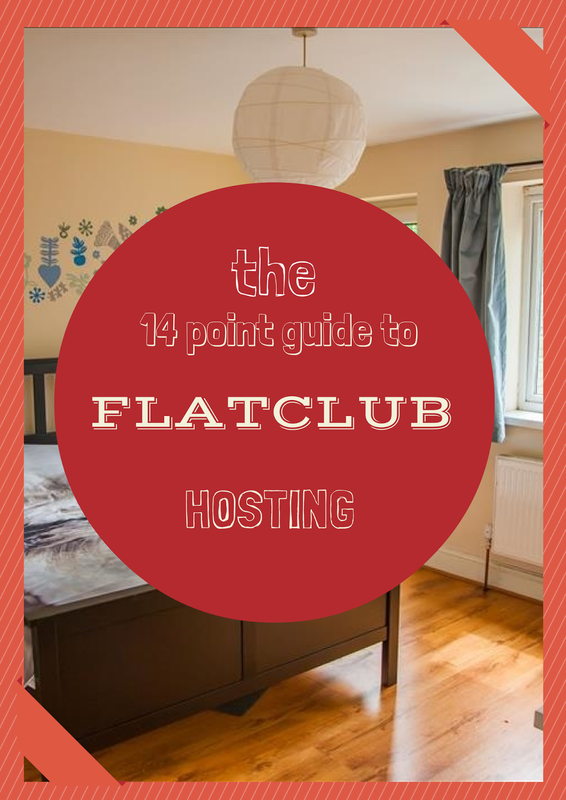 Did this guide help you understand all the important parts to hosting on FlatClub? If you're ready to start - click here to post your flat. If you know someone who may want to host - we'd love it if you referred them our way. If you'd like to get more information on any of the points above please write to info@flat-club.com. 2015 UK & Europe Startup Competition Guide! The UK & Europe Startup Competition Guide - 3rd Edition - Interactive for 2014!